Expedition 36 astronauts and cosmonauts wave goodbye during a farewell ceremony onboard the International Space Station. Image uploaded Sept. 10, 2013. After months in space on the International Space Station, two Russian cosmonauts and an American astronaut will return to Earth today (Sept. 10), and you can watch their homecoming live online. NASA astronaut Chris Cassidy and Federal Space Agency cosmonauts Pavel Vinogradov and Alexander Misurkin are wrapping up a five-month stay onboard the space station. They are due to land their Russian-built Soyuz spacecraft on the Central Asian steppes of Kazakhstan at 10:58 p.m. EDT (0258 Sept. 11 GMT). Misurkin, Cassidy and Vinogradov's undocking will mark the end of the space station's Expedition 36 mission and the beginning of Expedition 37, commanded by Russian cosmonaut Fyodor Yurchikhin. Yurchikhin, NASA astronaut Karen Nyberg and Italian astronaut Luca Parmitano round out the station's remaining crew. 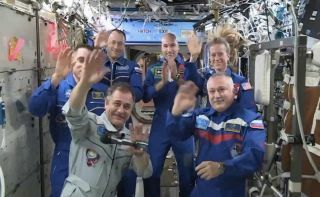 "The moment has come that we need to say goodbye to our wonderful home — this beautiful station where we spent over five months," Vinogradov said as he passed command to Yurchikhin during a ceremony on Sept. 9. "… I would like to thank my crew. [They] are wonderful professionals, great friends and I have enjoyed working with them a lot. We had a great environment here, very friendly and very warm." Yurchikhin, Nyberg and Parmitano launched to the space station in May and will stay behind and await the arrival of Russian cosmonauts Oleg Kotov and Sergey Ryazanskiy and NASA astronaut Michael Hopkins. That new crew will round out the Expedition 37 team after it launches on Sept. 25. During Cassidy's time in space, he ventured outside of the space station to perform multiple spacewalks including one previously unscheduled spacewalk with NASA's Tom Marshburn during Expedition 35 to repair a leak of ammonia on the outside of the station. For his last bit of time on the station, Cassidy collected urine and blood samples, storing them inside the Human Research Facility's science freezer, according to NASA officials. He also replaced a fluids control and pump assembly in the Tranquility node's water recycling system. Rotating crews of spaceflyers have continuously manned the $100 billion International Space Station since 2000. Construction of the orbiting laboratory began in 1998 and five different space agencies representing 15 countries contributed to the building of the space station. It is the largest manmade structure in space.